8, 9 and 10 of January 2015 the Stallion Show will be held in Drachten. The KFPS Stallion Show is the highlight of the year. Don't miss to see the best Friesian stallions! Are you a fanatical and ambitious rider or driver, and are you fond of the Friesian Horse? Do you want to enhance your knowledge about (Friesian) horses, your riding skills and visit the Royal Friesian (KFPS) Central Mare Show? Come to the educational ‘Horse and Rider Instruction Week’ in the Friesian Congres & Horse Centre in Drachten! This program is in English. Stb stallion Sjouke 453 come to Poland on season in 2014. Managers invite breeders from other countries to come for covering. Below is the offer. 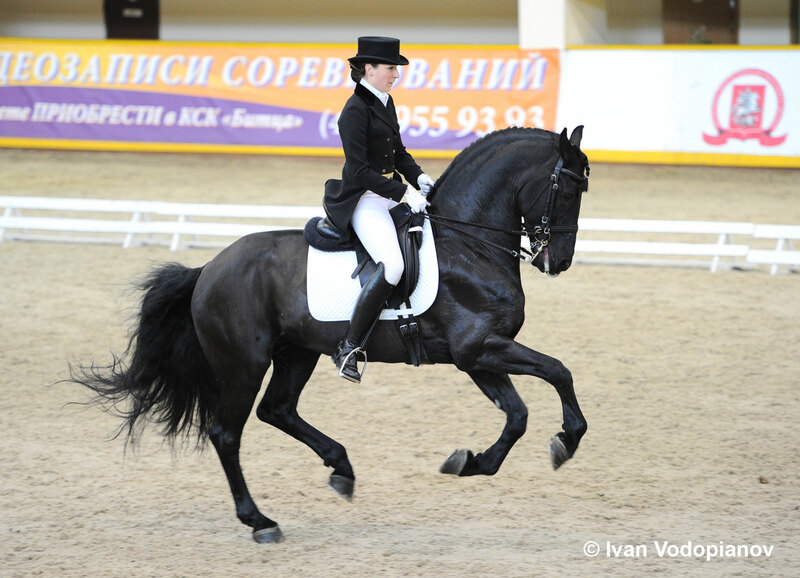 First Sport Friesian in Russia! In the end of 2013 Marcus in 't Rietveld (Beart 411 x Gaije, fokker: D. Post) owned by Marina Shikhareva for the first time in Russia has got a Sport title. 9-year-old Marcus in 't Rietveld ridden by Olga Kovyrsina competed in their first Prix St. Georges this autumn. In December 2013 judges rewarded him with 64,517 % in Prix St. Georges on the Winter Cup, held by Equestrian Federation of Moscow. In the show ring Marcus recommended himself as a great partner, with willingness to cooperate with the rider and potential for further growth. 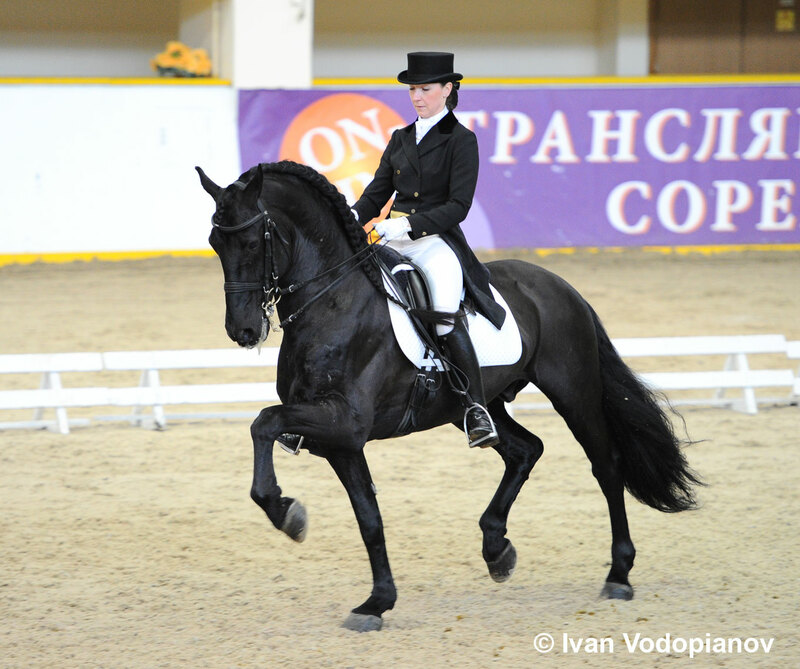 Trainer of Marcus, Mrs. Tatiana Ushakova is International 4* Judge, she is a trainer of two Dressage Team Russia members. Tatiana Ushakova: «We are pleased to work with such active and honest stallion, these features are necessary today for successful international competition». 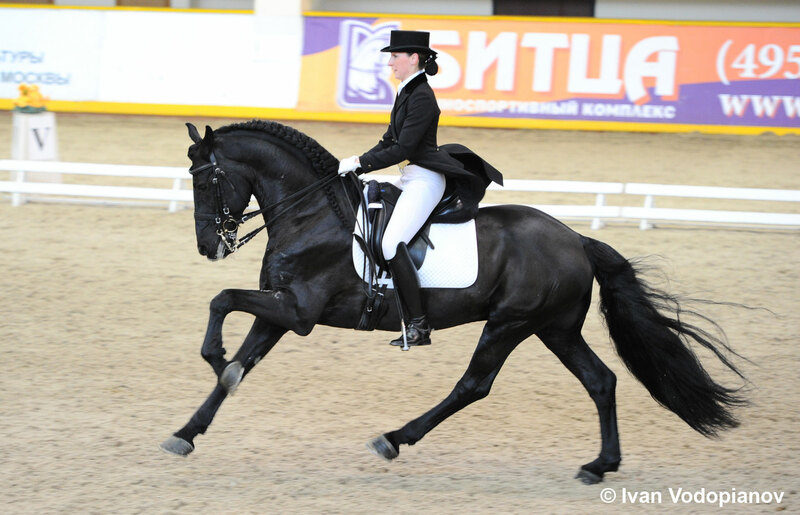 Today Tatiana Ushakova and Olga Kovyrsina are training Marcus for Intermediate I, and we all believe that they can further reveal the potential of this wonderful horse. In 2009 KFPS organized an Education Week with information about Friesian Horse especially for foreign members. This was a big success and that is why they are organizing this course again for 2013. On this course we will teach you all the things you need to know about judging of Friesian Horse including the racial aspects, the conformation, structure of the legs, lameness and leg defects and the movements. We will also give a guide to the order of inspections. We will also have a presentation from veterinary surgeon giving all sorts of important information. We will give information about breeding goal, and we are going to visit one of our inspections to judge along with one of our inspectors in small groups. We are planning to go driving with Friesian Horse one evening. The course will be organizing in a week when there will be many other attractions/events to visit in Friesland. The language is going to be in English but we also have books in the German language and some documents in French and Spanish. The course will take place from 24 till 31 of July 2013 at Drachten. The price for course is 295 euro and that is including lunch and drinks for 5 days, the course book, certificates and a dinner at the end of the week. If you want to take part on the course, hurry up: the minimum for the course is 24 people, the maximum for the course is 42 people. 10, 11 and 12 of January 2013 the Stallion Show will be conducted. This action can be rightly called the Friesian horse Event of the year! 26–30 of November 2012 – First round judging young stallions in KNHS-centrum Ermelo.